We’ve been back in the UK for 7 weeks so far, and it’s been quite a whirlwind. We eventually managed to get our Lebanese apartment packed up, furniture items sold, goodbyes said (all of which is much easier said than done), and catch a flight back to Heathrow with 6 bags. We’ve been moving around a lot since we got back, a new location every week, visiting family and doing some official debriefing. Now the flurry of activity is winding down, it’s time to do some unofficial debriefing on a more personal level, and to focus on what lies ahead. The best thing about being back has been to spend time with family and friends, seeing Petra bond with family has been really special and has also given us a chance to sit back and relax! We’ll be in Birmingham while Michael finds a job and then relocate to wherever that might take us. My job will initially be to help get us all settled, and then I’ll see what evolves from there. We’re trusting in God’s leading so that we end up in the right place for all of us, a place where we can all put roots down and thrive. People have asked how we feel about the move and being back in England, either expecting us to be elated and relieved or struggling with reverse culture-shock, but honestly we’ve been on the move so much that we haven’t had a chance to feel either yet. We’re currently staying in the same apartment we were in when we returned briefly to have Petra, it was so strange to walk through the front door again and have all the raw and vivid memories come flooding back. We feel in some ways like we’ve been in a time-warp, although we’ve slotted straight back into the old familiar, there’s been so much that’s happened in that significant time in-between. Because very few people here saw or experienced our lives in Beirut, those couple of years feel like a secret chapter, one that has been hugely significant and formational for us. We’re starting our last two months in Lebanon, so our transition phase in returning to England is definitely underway. We’re ending our time here positively, as a natural conclusion to a 2 year contract which actually got extended by 6 months due to the arrival of Petra. As I’m sure you’ll agree transitions are strange and challenging; while we’re looking and planning ahead, we’re also very much still here in Lebanon, normal life continues in tandem with building in extra tasks which will pave the way for our return. Often we feel torn between wanting to be very present here, with Michael continuing in his work, Petra and I continuing some of our work with the Syrian community, and making new friends, all despite the change to come. We’ve been through quite a few major transitions together since we were married, and we’ve learnt the importance of investing and continuing to be present in the present, despite any hoped for or planned change to come. It is certainly a test of perseverance and faithfulness! We really want to finish well. There seems to be a natural sense of closure in the work we’ve been doing here. Michael is working to finalise and wrap up all the system and database changes he’s made for LSESD. He’ll also be training up his replacement who will maintain the work he has pioneered here for the organisation. The health classes I organised for Syrian refugees in Mansourieh has come to its pre-arranged end, and the Mother and Baby group will finish this coming Monday, just as Ramadan starts. I’ve hopefully found someone who will take up the baton and re-start it again once Ramadan ends. We’ve just done our last visa run, which coincided with a Skinner family holiday which had been planned a year and a half before. Michael’s family is very big and spread across the world, so every 2 years we gather together somewhere convenient. 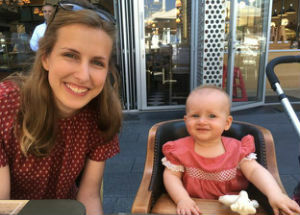 This time we gathered in Crete, it was such a special time with family and in many ways made us realise how much we’ve missed family being near, especially now we have Petra. After a great time away, we’ve been able to come back with fresh energy to start the process of leaving and saying goodbye. We’d appreciate prayers as we say goodbye here, that we would end well, and that the transition back to life in England would be smooth, especially for Petra who will be leaving everything she’s ever known. Our first couple of months back will be crazy busy as we have debriefs with BMS and other commitments booked in; we will be moving every week. Beyond that, we don’t know anything about what our life in England will look like, or where we will be living long term, it will depend on where Michael is able to find work. Prayers for all these details would be very much appreciated! As ever we’re so very thankful for your friendship, support and encouragement! Thank you so much. This Summer, thanks to lots of generous donations and hard work, our church opened a Community Centre in our local area, Mansourieh. The Community Centre, specifically designed with refugees in mind, is one of a kind. 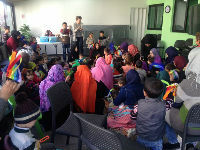 While the concept of a community centre and community activities is very common in England; it is very rare in Lebanon. Lack of town planning won’t allow for the accessible space a community centre would need, and on a cultural level people here rely heavily on their families for a sense of community and support. As foreigners with no family here, we found that hard at first, there was no public space to gather around activities or community events whereby you could get to know your neighbours. Our church and our work was our sole place for meeting new people. I use the community centre to host the weekly mum and baby group for refugees, and last Friday we invited those mums to our first free, monthly community health class. I have a lovely doctor friend who works in the camps in Zahle who agreed to present on health issues commonly faced by refugees. Although we’re a long way away from the camps here, about 10km away from downtown Beirut, and in a more suburban, Christian part of the city, many of the issues the refugees face in camps are similar to the ones faced in more urban areas. The homes that refugees live in here are very small, usually dilapidated or crudely built, and almost always overcrowded. They use sobia (diesel) heaters in confined spaces to cook and keep warm, and cannot afford a visit to the doctor if things go wrong. Clearly, there’s a fair bit that could go wrong health-wise due to living conditions and lower immunity as a result of poor diet and the effects of poverty and trauma. Additionally, many of the refugees in our area are from more rural settings in Syria, so are less educated, and less literate so less able to identify and treat health issues. The first session we ran covered skin issues, covering basic wound care, fungal infections and eczema, lice, scabies, viruses and bacteria, and taking a temperature. The women had lots of questions and one child was diagnosed on the spot with chicken pox! I’m so thankful for the space that the centre provides, otherwise activities like this would be impossible. The centre also hosts regular Arabic literacy classes, English as a foreign language, and Bible studies. There is hope that this year we will receive funding to launch more vocational programmes such as Sewing classes, Computer Skills classes and more. All these things empower our refugee neighbours and give them a hope for the future. It makes me so grateful for the sense of civic society we grew up with, knowing that there is a community of people who are willing to support us if we chose to reach out for help, friendship or self-betterment. Hope all is well with you, and that you’re keeping warm and enjoying the Christmas festivities! Christmas has certainly arrived in Lebanon, it seems that every roundabout has been taken over by Rudolph and the nativity scene, illuminated in flashing lights. I write this having just come back from a Carol service hosted by the Anglican church in Beirut, it was good to refocus on the reason for Christmas, particularly in a nation and region that desperately needs the impossible peace and reconciliation that Jesus came to bring. As we dig deeper into winter, Michael and I continue to build momentum in our (very) different spheres. Michael is busy working with the Donor Relations Department of LSESD (Lebanese Society for Education and Social Development). Most recently, he’s developed efficiency management systems to monitor progress and help keep everyone on target. The aim of his work is to enable the busy team of 13 to work at a higher capacity in order to generate a greater income for the different arms of the charity, all of which do important work to help vulnerable people in Lebanon. Petra and I continue to get involved locally, we host a Mum and baby music group for Syrian refugees in our local area, Mansourieh. The group meets at our church’s community centre, which exists specifically as a place of refuge and resourcing for the 250 refugee families in our area. We welcome around 8 mums and lots more children each week, the group gives them a safe and warm place to play and meet together. It’s a great place to practice my Arabic as none of the mums speak English, and next week we are hosting a Christmas party where I will attempt to explain the true meaning of Christmas, in Arabic! We also plan to start monthly educational sessions for the mums, much like antenatal classes in the UK. Last week there was a nappy and milk distribution, and Michael was part of a team that helped pack medical and first aid boxes for distribution to the 250 families who have registered with the centre. The security situation here is ever volatile, and despite multiple alerts over the last month, is still safe for now. The resignation of President Hariri and President Trump’s recent statement about Jerusalem both threw the country into a heightened state of tension. There have been protests following Trump’s announcement but these have been around the American embassy and in the Southern suburbs, which are home to hundreds of thousands of Palestinian refugees. On this matter, the different and often opposing sectors of our multi-faceted society overwhelmingly unite to denounce Trump’s statement. We continue to pray for peace here in Lebanon and the wider region. We hope July finds you well? We’ve had a few things going on over the last month or so. We had a great time with my Mum and Dad while they were here. It was so good for me (Claire) especially as I had extra help with Petra, and also adult company and conversation every day for a month! It was nice showing them our life here and realising that we do know Beirut pretty well now. We had trips to the souks and went up to the mountains a couple of times, it always amazes us how beautiful this country is. The day before Mum and Dad were due to fly out, we had news that my Grandad (Mum’s dad) had had a huge heart attack, he then passed away in hospital a week later. Sadly, Michael’s Nan had also passed away a couple of weeks before that after a long battle with Alzheimers. It’s been strange processing the grief of losing Grandparents away from home. We have felt the distance more than usual, and realise how much a funeral helps in the process of saying goodbye. Despite the sadness that June held for us both, July started with wonderful and very exciting news, with the birth of our little nephew Gideon! Lots of my spare time has been spent looking at pictures of our handsome little nephew, and we’re making a very brief trip to London in August to meet him, a trip which doubles up as a visa run for me and Petra. 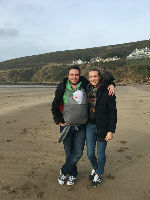 We’re also hoping that our trip coincides with the arrival of another little niece on Michael’s side! So, although not much to do with Lebanon, our lives have been somewhat focused on these two deaths and the joy of the two births, the second still to come. Life here in Lebanon is ticking over. We are in the process of praying and deciding about whether to extend our initial 2 year contract by another two years, a decision to be made jointly by LSESD (the NGO Michael works for), BMS in the UK, and ourselves. Michael’s work is picking up a bit after a slower couple of months and he’s now running projects to build systems so the Society is better able to manage their donors. With one team based in Lebanon and another in the USA, 8 hours time difference can sometimes mean some late meetings! For Petra and myself, life is quieter as the community groups we are part of have finished, due to restart after the summer. Most people choose to leave Lebanon through July and August if they can, due to the heat, so we’ve been embracing air-conditioned public spaces, and thanking God that we live on the ground floor which is slightly cooler! Petra continues to develop in her own way, starting to stand and then feeling so proud of herself that she claps the achievement, while hastily returning to sitting position. Watching her grow is a joy and can be quite amusing. Following on from Michael’s recent ode to the Barghash, I thought I’d give you an update on how and what we’re doing out here in Beirut! We all seem to have adapted really well to the move back. We’re really thankful that we had our apartment and car kept for us which meant that other than buying a few baby related things, we didn’t have to think about getting set up here again. The initial shock of Lebanon didn’t really hit us this time either, we seem to have weathered the worst of it in our first 6 months out here, which we’re thankful for! That being said we do of course miss friends and family a lot, but we were happy to see the friends we left behind here too, and had a lovely welcome back from work and church. We’re having to remember to conserve water, electricity and internet again, which is even more difficult this time with a baby who's being weaned onto solid foods - the washing machine is getting some good use! We’ve even had our first UK visitor, it was really great to have our friend Sam stay for a couple of nights in March, we introduced him to the main Lebanese experiences: Lebanese driving and Lebanese food! A couple of days after flying in, Michael went back to work as before, straight back into language study and a Monday - Friday routine. He’s been enjoying being busy at work as he continues to organise and improve the efficiency of LSESD’s donor database. Due to a few changes with LSESD’s charitable arm in the US, he’s making a trip to the states in a few weeks to do some training for new staff out there. 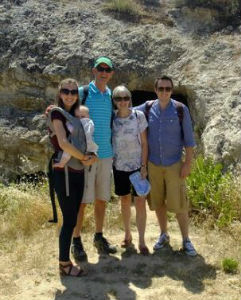 Michael’s trip coincides with my parents’ visit to Lebanon, which works well. Michael’s only going for a week but it will be the longest time we’ve been apart since we met, 5 and a half years ago! I hate Barghash. The winged sticky legged beastie that flies through the air looking for her next victim, she seems to like our home; this just will not do. You have come across her before and will definitely come across her again, she whistles in your ear just before her proboscis penetrates your membrane. In Arabic she goes by Barghash but you may know her as ‘Mosquito’. We got back to find a growing number of mozzies had decided to ‘winter’ in our apartment, It was dark and they must have found a bit of stagnant water down one of the pipes in which to spawn their young. My war with Barghash goes back a couple of decades, I’ve always had ‘sweet’ blood so they flock to me like a pod of killer whales looking for their next seal. Lebanon is more geared up in the war against the mosquito, so we have bought all sorts of spray and vapour to keep them out of the bedrooms. We also bought a net for Petra’s cot; however this backfired… After putting her down one evening one of the vampirous vermin had snuck in under the net, hence we woke to find she had been bitten 13 times on the head. Barghash has no sympathy for women or the young, she had won that battle against my daughter, so I stepped up my game and bought an electric bat. We are slowly winning the war and clearing the house of each mosquito, one at a time. Some days we lose, most days we win. Thankfully we live in a malaria, dengue, West Nile virus, yellow fever, encephalitis and Zika virus free zone. Most of the rest of the world are not that lucky, so a bite really can cause life changing illnesses and even death, which is no laughing matter. The Skinners are well and truly back in Lebanon! We spent much longer than expected in the UK because we wanted to complete Petra’s inoculations and there was a slight delay on Michael’s visa. 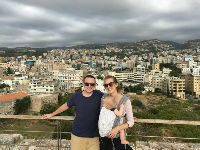 We were slightly apprehensive about returning to Lebanon with a 4 month old baby, despite being well set up with an apartment, car, and even a cot which we had the foresight to buy before we flew home. Although we could remember our first 6 months in Lebanon well, our previous experiences seemed so far removed from the reality of life in the UK, particularly once Petra had officially arrived on the scene. We wondered if we would struggle with the same culture shock we had experienced the first time round, and whether it would take us a while to find our groove again. Thankfully, we’ve felt a real grace to slot back into life here. The culture that we remember being so abrasive to our senses when we first arrived last year seems so familiar this time. Last January, there seemed to be so much to contend with: abnormal sights, sounds and smells, as well as the more obvious struggle with language, a different work culture, trying to figure out local amenities and an entire population of unfamiliar faces. This time, we have enjoyed reuniting with beautiful, familiar faces, we know where to go to get what we need, driving here no longer intimidates or shocks us, and the starkly different Middle Eastern cityscape we live in almost goes by unnoticed it’s so familiar. Thankfully, Petra loves new faces and places and so the change also suits her well, as far as we can tell! Thank you to everyone who supports us in friendship and in prayer, we have really felt that things have been so much smoother for us than we would have otherwise expected with so many changes taking place! That Michael can slot into work quickly to make a real difference for LSESD, the organisation we’re volunteering for. That our Arabic gets back on track after 7 months out. That Claire and Petra can find a good routine, wanting to be able to be relational locally and get involved where we can. It would seem that we’re both extraverts so need to find a regular outlet! Now that the whirlwind of Christmas has been and gone, it seems an opportune time for me to update you all on the last few months. 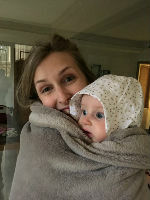 Its been an amazing first 3 months with Petra, learning how to do this whole parenting thing; there have been laughs, tears and a whole spectrum of emotions as we navigate everything from burping to nappies and sleeping (or lack of). It feels like we’ve reached the summit of a foothill over the past week or so as we’ve hit 3 months, with the three of us learning how to live well together. Christmas was great, we spent time with my family in Devon in early December, then had a week with Claire’s family in Worcester over the Christmas holidays. I think the Grandparents have been trying to get in as many hugs as possible as our departure date to Lebanon grows ever closer and more imminent. We were talking the other day about how we’ve already forgotten a little of what it's like out there and I think we’ll probably go through elements of culture shock again as we try to re-trace our steps with Arabic, negotiate the roads, and dramatically decrease our use of water and the internet. We’ll be flying back to Beirut in mid-February, date to be confirmed once we have the date for Petra’s final course of injections. We’re both a little apprehensive about our return with Petra, but know that it will work out well and are looking forward to visits from friends and family in the coming months. Please pray that our last 6 weeks in the UK would go well and we would get to say goodbye to all our friends and family as we try to see them all for the final time. Pray that we would settle back into life in Lebanon and find it easier to engage with community and new friends. Pray that Petra is in good health for the next few weeks as she has her injections and we fly out. Here’s another update for you on what we’ve been up to through May and the start of June in Lebanon. The weather is heating up nicely, it’s a balmy 25 -30c which makes us very grateful for air conditioning! We’ve been getting into more of a flow with work, spending more time with new friends, and getting involved more with local and church events. Michael has now finished his work at Beirut Baptist School (BBS) where he did an audit of the school’s procurement habits and was able to recommend some procurement systems that would suit their needs and save them a lot of time and money. He’s now been asked to work for the parent organisation, LSESD up at their main campus (where I work) to improve efficiency, procedures and workflow systems. It’s definitely a challenging task but one that he’s well equipped for and motivated to get his teeth into! He’ll continue working on the project from the UK when we return over the summer. My work is picking up speed as well, after a few months of getting used to a new job and (very) different way of working, I’ve been making progress applying for funding for SKILD (Smart Kids with Individual Learning Difficulties) and BBS from existing donors and trying to make some new funding connections too. Outside of work we’ve been able to help join in with some local church events for Syrian and Iraqi refugees. We’ve helped at a YFC kids club which hosts about 50 local refugee kids who come along for games, activities and dinner. 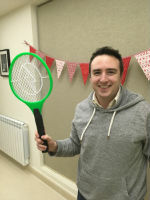 Michael also recently helped at a men’s event that the church organised for local refugees, which included a BBQ and ‘manly’ competitions like tyre throwing, and time challenges to see how fast you could saw wood with your left hand and bang a nail in. The regular events the church put on are a great way to welcome local refugees and give a society without much money the opportunity to have fun and build community. Now that Ramadan has started, we’ve signed up to help host a Iftar meal at the church. The Iftar meal is when Muslims break the days fast, and while normally Muslims would feast together as a community, the refugees are often unable to afford such an abundant treat. The church hope to show welcome and acceptance to the refugees by gathering them for a feast hosted by local Christians. Our plans for returning to the UK are catching up with us quickly. Due to visa restrictions we’re now planning on returning to the UK in mid-July and will continue to work for a while once we’re back. We’re really looking forward to seeing family, friends, and have a list of food that we’ll be indulging in, with bacon sandwiches at the top. Despite the excitement, we’re beginning to get to a place where we’re feeling settled and familiar with our life and surroundings here in Lebanon, so this will definitely be another transition that we will have to make! So many changes in one year has definitely been challenging at times but in all the change we have found security in knowing that God never leaves us and loves us constantly no matter how pathetic or out of our depth we feel. Thank you for your ongoing support in every way, encouraging messages have kept us going and helped us to remember that we’re not isolated on the other side of the world, but that people care for and love us. We hope you feel that you have been able to keep up with our news and progress in Lebanon through our regular blog and monthly newsletter updates! 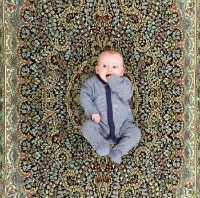 We have some further news to share with you: We are expecting a baby! Claire is 15 weeks pregnant with the due date set for October. We’re both very excited to be expecting a little Skinner! We have decided in conversation with BMS to come back to the UK to deliver the baby. We then plan to head straight back out to Lebanon when the baby has had their first inoculations. We plan on returning to complete our assignment with LSESD and continue the work we have started. We wanted to share the news with you before announcing it more widely because we have so appreciated your financial, moral and, from many, prayer support over our time here so far. If news of our brief return home affects your plans for financial giving, we’d really appreciate if you could let us know so that we can alter our budgets as we plan for the future. Thanks again for your support, we couldn’t do this without you! Two months into life in Lebanon and we feel like we’ve come a long way. We’d anticipated that the first few months would be primarily focused on settling in, becoming more familiar with our surroundings, and trying to establish ourselves in a totally new and different place. Other than that we had no idea what to expect! We have begun to settle, we’re thankful to have a furnished apartment, a car, we’re 6 weeks into work, 7 weeks into Arabic study, and we’ve begun to make some friends. While progress has felt slow at times, when we look back at everything that’s come together we are impressed and encouraged! Moving to a new country with a very different culture and language is something neither of us had done before. It’s a startling realisation when, 3 weeks in, you realise that you’re not on holiday, and you’re not going home. Interested acknowledgement of cultural difference transforms into something of an assault course that you have to muster up energy to negotiate in order to get anything done. Lebanese people are so gracious and willing to help, we’ve had people drive us across the city so we can buy kitchen equipment from discount stores, we’ve been driven around second hand car shops and sales rooms, people have taken us out and had us over for dinner and breakfast to make us feel welcome, and stopped in the street to chat for an hour about the best places to visit in Beirut. Even ‘Service’ (communal taxi) drivers have dropped us for free when they’ve found us wandering around lost in the middle of Beirut. People’s kindness has been staggering; in the UK we were never vulnerable enough to need it, and so perhaps never truly discovered it. In other news, Michael, who benefits from school holidays, gets two Easter breaks this year to celebrate the evangelical and orthodox Easters (! ), my desperation for real bread has driven me to start baking sourdough which is a taste of heaven in Beirut (all we need now is pork bacon), and a couple of weeks ago we discovered an English pub in Beirut so we were able to feel bizarrely at home and keep up with the 6 Nations! The life of an ex-pat (immigrant), eh! Getting our teeth into work, this has felt a bit slow and cultural differences can sometimes hinder communication and expectations. After a couple of bouts of ‘Beirut Belly’, we’re more than ready for a sickness free spell now! We’ve met some great people, we hope we can build friendships – good friendship take time to nurture! Arabic is hard, and difficult to study when there’s so much to do in terms of getting settled.